Sometimes, things don’t go according to plan when traveling to foreign lands. And sometimes, when things don’t go as planned, something remarkable happens. After spending a few days exploring the backstreets of Jaipur and visiting the magnificent Amber Fort, we decided it was time to move on to our next destination. The plan was to take an overnight train to Udaipur, the ‘City of Lakes’ located in the northern state of Rajasthan. But the travel gods had something else in store for us that day. Now, to fully appreciate this story you must first understand our environment. The above photo was captured from the window of our hotel room in downtown Jaipur. It’s apparently a “bus stop”, but in actuality it is a disgusting garbage dump. Don’t look now, but there’s a man urinating on the side of the road. Seriously. That dude in white, the one facing us near the red striped bus, he’s taking a leak at that very moment. Lovely. And let’s not forget about the fat black pig eating the garbage beside the orange bus. Well, the task of the day was to secure train tickets for an overnight trip from Jaipur to Udaipur. We managed to navigate the noisy, overcrowded, confusing streets of Jaipur and found a travel agent that sold us two 2nd class sleeper seats. The train departed at 10:00 PM, so we decided to enjoy one last meal at our favourite dosa house before leaving for the train station. 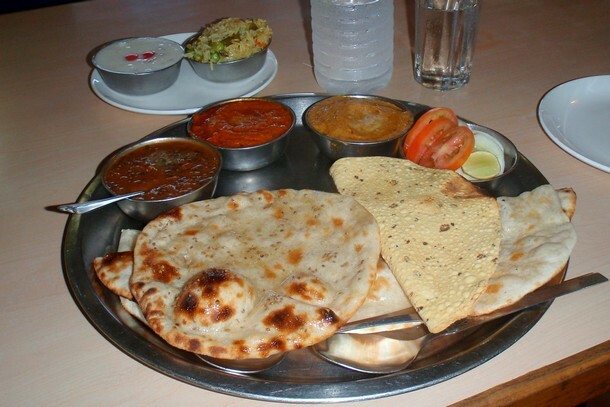 The south Indian-style cuisine was delicious, but it wasn’t the food that made this meal so memorable. About half way through our lunch a torrential monsoon hit the city, flooding it within minutes. It was quite amazing how much rain fell in such a short period of time. And with the city’s poor drainage, it didn’t take long for the streets to swell up. We waited in the restaurant, hoping the rain would let up. It did not. After about an hour we gave up. It was time to brave the weather and walk back to our hotel. Needless to say, it was a disgusting trek. Remember when I felt the need to show you the picture of the gross garbage dump beside our hotel? Now imagine for a moment that all of that garbage and sewage went under water and began swirling around the city streets. You guessed it. We were knee deep in filthy garbage toilet water. And we were wearing flip flops! After a long shower, we laid down for a short nap. We had a long night ahead of us and didn’t know when we would have a decent bed next. Within about two hours we were violently ill. Let’s just say we were thankful to have paid the extra rupees for a private bathroom. After the vomiting and diarrhea came the cold sweats and hallucinations. It was bad. Really, really bad. We barely had enough energy to walk to the front desk and ask to stay for another night. We missed our train and lost the money spent on the train tickets. It was frustrating, but sometimes these things happen. Because of this unforeseen event, we found ourselves back at the same travel agent 48 hours later. But this time we noticed something that had eluded us on the previous visit. We noticed a large poster of Mehrangarh Fort in the city of Jodhpur. We were impressed. It’s one of the most incredible forts we’ve ever seen! 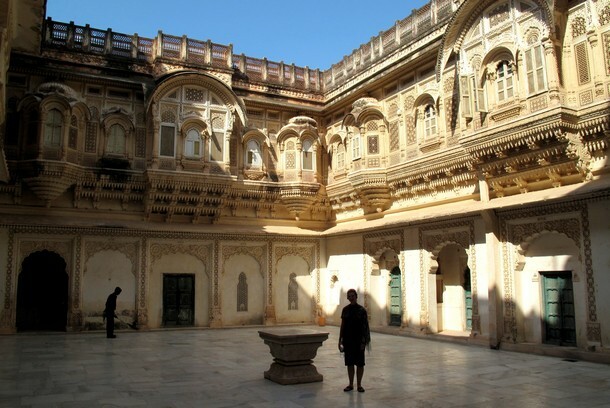 We asked the travel agent about Jodhpur and the fort. “You can take a 6 hour bus from Jaipur to Jodhpur, spend a few days there, then take the bus from Jodhpur to Udaipur. You can do both if you wish”, said the friendly agent. We arrived late afternoon without a plan, so we took a leap of faith and let a tuk tuk driver take us to his recommended hotel. Did you read our recent post on travel scams? We knew the young driver would receive a commission for bringing us to the hotel, but we didn’t care. We had no expectations. The hotel was simple but clean. It was an old guest house with beautiful old Rajasthani artwork and original wooden doors. The rooms were quite small and the doorways were made for people less than five feet tall. But it was cute and cozy, and the price was right. Most importantly, it had a fantastic rooftop terrace with unobstructed views of Mehrangarh Fort. 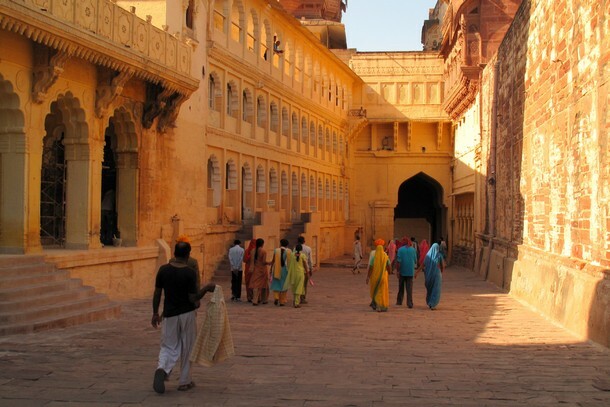 Mehrangarh Fort towers over the Blue City on a rocky hill that rises 400 feet above the city. The 15th century Hindu fort is said to be one of the largest and most impressive forts in all of India – and she is quite the looker! It was briefly featured in the blockbuster movie ‘Batman – The Dark Night Rises’. You see a great shot of the fort when Bruce Wayne escapes the subterranean prison by climbing out of the deep circular cave, and again when they show the young child escaping the prison later in the movie. If you visit the fort, we highly recommend you purchase the audio tour. It’s one of the better audio tours we’ve listened to and gives an interesting overview of the fort’s history. There is a lot to see within the fort, including a museum with priceless relics and multiple palaces that housed Rajasthan royalty. The craftsmanship and detail is extraordinary, as is the enormity of the magnificent complex. 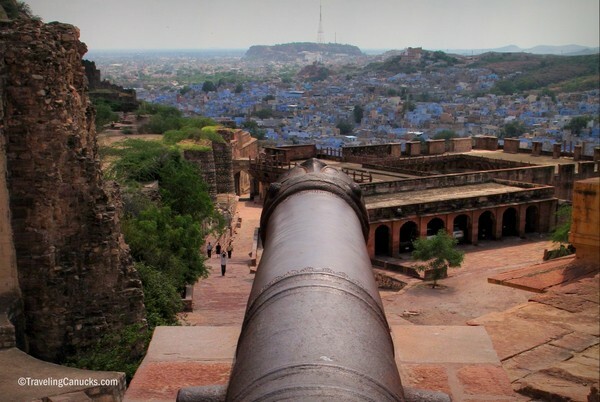 An old canon points to the Blue City. I wonder how many times it was used in its lifetime? 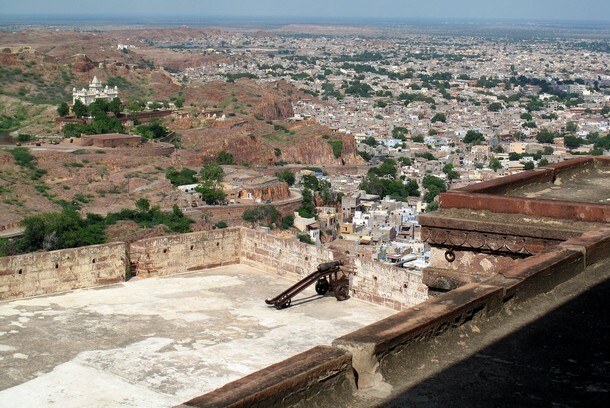 Views of Jodhpur from the thick stone walls of Mehrangarh Fort. 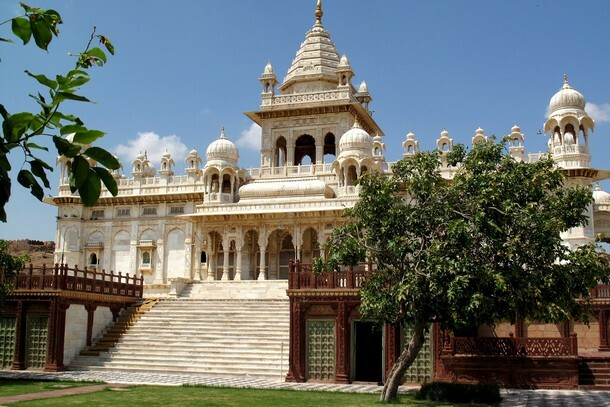 The white palace on the hillside is Jaswant Thada, a white marble memorial built by Sardar Singh in 1899 in memory of Maharaja Jaswant Singh II. Inside the fortress walls. The tiny people walking around gives you a sense of the fort’s size. The old city surrounded by thick stone walls and rolling hills. We love that the residents have committed to painting their homes and buildings the same colour blue. The outcome is quite spectacular. It reminds us of the white stone buildings on the Greek Island of Santorini. There were more local tourists in the complex than foreigners, a testament to the importance and significance of the fort and it’s many palaces. After exploring Mehrangarh Fort we jumped in a tuk tuk and visited the nearby Jaswant Thada, a stunning white marble memorial that keeps watch over the city. When we reflect on our 48 hours in Jodhpur one thing is clear – it’s a must for every travel itinerary to Rajasthan. India is an interesting country. 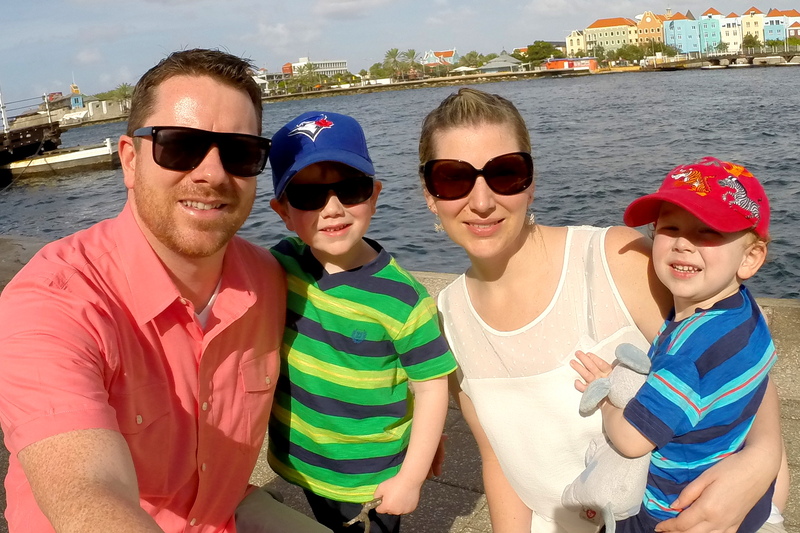 One minute we’re treading gross sewage water and battling an illness that caused hallucinations; the next minute we’re standing in one of the world’s most impressive forts, overlooking a city coloured in blue. See map below to find out where Jodhpur is located. Thanks for sharing! Sometimes things dont go as planned. We are thinking of taking on India next year. Thanks for this helpful post. I think every traveller should visit India. It’s one of the rare countries left that still has deep cultural roots, but even that is changing. Things certainly worked out well for your trip after all. The fortress is amazing – I’d love to see that upclose and from that cozy rooftop terrace. Love the photo of Nicole getting the dancing lesson. Wow, I just came back from India about a week a go and found your post. I was planning to go to Jodphur but 6 days wasn’t enough to visit the city. I ended up going with the golden triangle trip, Delhi – Agra – Jaipur. My favourite monuments are the Agra fort and Taj Mahal. The Amber was pretty cool as well. I’ll definitely be back. Maybe the next time, I go north to Kashmere. Hopefully the northern borders will be safe enough to travel soon. The fort looks amazing, especially against the backdrop of the Blue City. What a view from the rooftop terrace! Glad things looked up after the sickness passed! Loved your posting. Great pictures and i totally agree that every traveler should visit India, even the food changes from city to city as like its culture. haha, it really was a memorable experience. Oh my god such a beautiful view. In 2013 I had plans to go to India but it was ruined because of Indian visa’s. Anyway I will try to get here one day. Yeah, we almost missed out too because of the visa. thankfully, everything worked out. Hope you can make it there soon. From the Pink city to the Blue city! 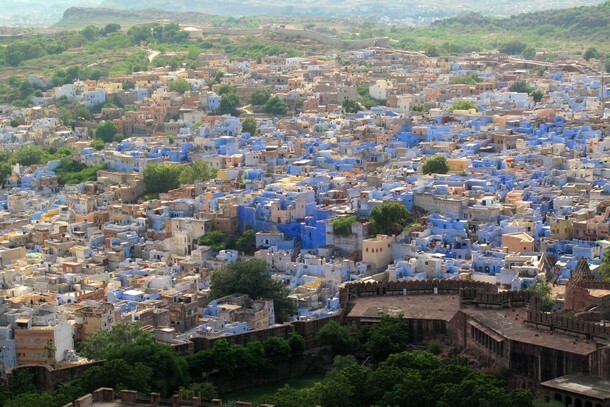 It´s like a blue treasure in the desert, even more beautiful than Jaipur I´d say. Jaipur was painted pink as a symbol of hospitality to welcome the Queen of England , I wonder what´s the story behind the color here..You took me on quite a journey with this post. Thanks! 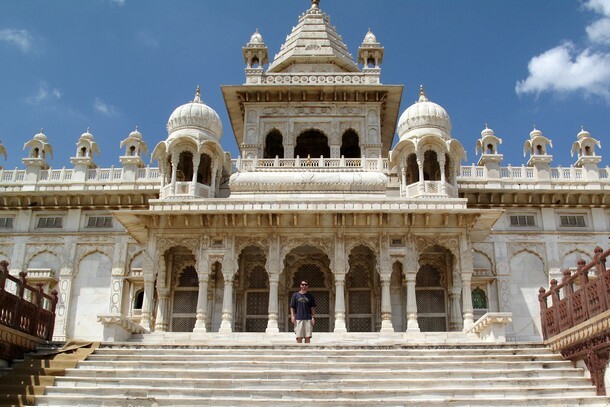 Cam & Nicole great info, you must loved Jodhpur .But I love Udaipur the most,basically Lake Pichola and spectacular view of the Aravalli Mountains from The Leela Palace Room .Try that you will feel like king. Last night I came back from Cox’s Bazar. Such an unbelievable experience I gathered visiting there. I think everyman should visit their own country to see the beauty of nature and remarkable places. wow, I just see this blog the Fort is awesome. I’d love to visit Jodhpur. The photos are beautiful and it looks as if you had an interesting trip. India seems like such a diverse country with lots to see and do. That food picture made me drool a bit! India can really sucker punch you sometimes, though its amazing sights are more than an ample reward! It sure does. By far one of the most challenging places to travel, but also soo rewarding. Beautifully photographed. loved the article and the place as well. Thanks for sharing.